Zap your way to the top in this new and exciting, free 3D game. Control your marble around easy to intricate full 3D levels, up and down slippery slopes, mastering physics contraptions such as air vents, jumppads and vortexes. Fight your way through AI controlled marbles and send them flying into each other and towards their doom. The more points you get the bigger you grow and the harder you are to be pushed around by physics mechanisms or other marbles. Navigate on several types of surfaces, such as sand, water, glass, ice and tarmac. Prove that you have what it takes by finishing levels before the time limit and get rewarded with upgrade points which you can use to improve your marble or change your skin. Not enough excitement fighting by yourselves ? 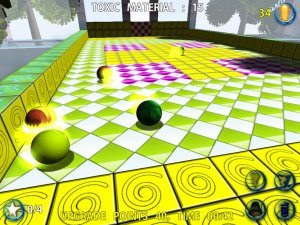 Add as many AI controlled marbles as you need to make the game really intense or join your friends in multiplayer games and battle it out on every map there is.